Kids adore butterflies. They are colorful and whimsical creatures that capture children's imaginations. This makes butterfly crafts popular with kids and a perfect activity to do in the spring and summer months. Butterfly crafts can be created with so many different materials which makes them versatile for all age groups! Today we are sharing one of our favorite butterfly crafts for kids. Save those toilet paper rolls you usually throw away to make these cute little butterflies today! They are super easy, and it only takes a few steps and a creative kid to turn old toilet paper rolls into adorable butterflies. That's it! Gather these few simple craft materials and let's make this easy butterfly craft! Begin by cutting the toilet paper roll into four pieces. If they aren't perfectly even that's ok, you can leave them as is or trim them down. If you can leave them as is, it adds to the uniqueness of each butterfly created by the children. Now it's time to paint the toilet paper roll pieces. Let your children pick what colors they want and give each one a dollop of paint. Make sure you have them paint both the inside and the outside as they both will be visible when this craft is complete. Get creative! 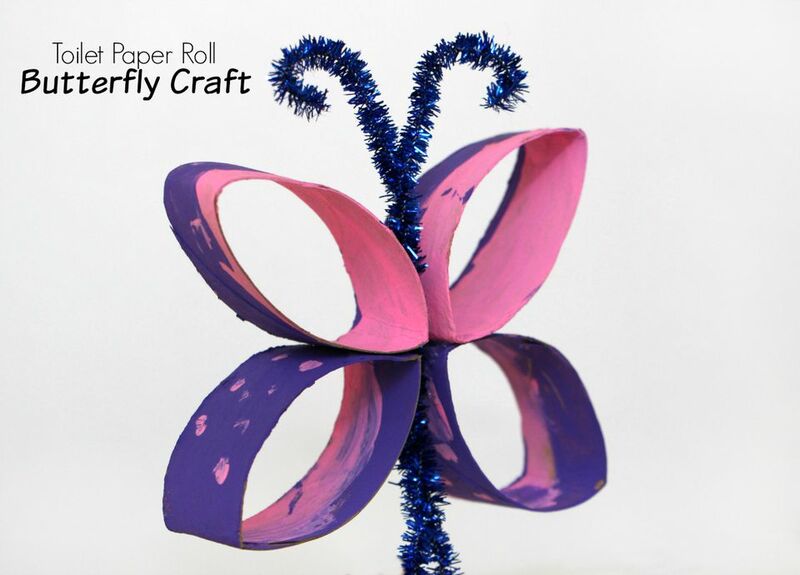 Once your paint has dried, it's time to put your toilet paper roll butterfly craft together! Fold your pipe cleaner in half, twisting the bottom part together and curing the ends at the top. This creates the body of your butterfly. Now flatten your painted toilet paper rolls and pinch the edges so that they form an oval shape. Next arrange the toilet rolls and pipe cleaner into a butterfly shape. Place two of the toilet paper roll pieces on each side, these will be the butterfly wings. Use a hot glue gun to glue the toilet rolls onto the pipe cleaner. That's it! You are done! Aren't they beautiful when completed? Use some string or fishing line to hang them from the ceiling of your home or classroom, or display them on an art wall. These little beauties are sure to add some whimsical spring fun to any room!